McCullum has advocated opening for years but - after a tantalisingly successful spell - now shifts to No. 3 to make way for Rob Nicol, just as he did in the limited-overs matches. Surely McCullum needs to be at his bristling, aggressive best facing the first ball. Psychologically it could give New Zealand an edge with his ethos for fearless leadership from the front. He has averaged 43.87 in 16 Test innings as an opener since taking the job fulltime in November 2010. Nicol's opening success in the limited-overs matches in Zimbabwe has clouded the evidence. Yes, he opens for Canterbury, and has scores of 107, 3, 3, and 1 this season in four-day games. But why not slot him into the No. 5 position as a clean swap until Dean Brownlie returns? McCullum and Martin Guptill have fashioned one of New Zealand's most successful opening combinations. In nine innings, against Pakistan, Zimbabwe and Australia, they average 43.55 runs per innings including two century stands. Compare them to John Wright and Bruce Edgar, who for years have been the New Zealand benchmark in the opening roles. They averaged 31.82 runs in 56 innings opening together, from 1978-86. Perhaps someone in New Zealand Cricket circles might suggest to Seddon Park groundsman Karl Johnson that a pitch which dries, roughs up and cracks on the fourth and fifth days is a thought for the second Test. Nethula showed promise against South Africa in the one-dayer at Napier, and would have got more wickets than his 2 for 60 from 10 overs had it not been for some sloppy fielding off his bowling. He has matured this season and in six first-class matches has tightened up his overs. The evidence is 20 wickets at 30.20 with an economy-rate of 3.41, including his 9 for 50 effort in the match against Otago. Yes, he and Vettori both take the ball away from the right-hander but Nethula at least offers a point-of-difference to the cannon fodder Tim Southee served up last week. Bringing in another pace bowler in the 130-140kph bracket might seem a trifle conservative when New Zealand came nowhere near taking 20 wickets in Dunedin. If Nethula plays he will be New Zealand's first specialist legspinner since Brooke Walker in May 2002. However, in recent Tests and the two first-class matches this season Seddon Park has been more conducive to seam. Making a sudden change to the default conditions may be a tricky task. Rain ruined what would have been a fascinating final day of the first Test, in Dunedin. New Zealand needed 264 runs off 98 overs with Ross Taylor and Brendon McCullum ensconced on a flat pitch against, arguably, the best bowling attack in the world. In reality the hosts' chances were slim, given that a 400-plus fourth-innings target has been chased down only four times in 2035 tests. The origins of that situation are clear. The New Zealand batsmen did not make the most of the first innings and gave their bowlers too few runs to bowl at. After dismissing South Africa for 238 they only mustered 273 in reply, and 33 of those came from Trent Boult's wild swipes at No 10. Four other batsmen scored in the 30-48 bracket but failed to go on. The highest partnership of 65, for the third wicket between Taylor and McCullum, was perhaps the most disappointing. They had shown hints of how to get the better of their much-vaunted opposition by defending stoutly behind the ball but did not carry on. Kruger van Wyk had a sound wicketkeeping debut. He made 36 runs, did not drop (or take) any catches, helped effect the run-out of Mark Boucher, gave away just two byes over two innings and undoubtedly contributed valuable intelligence on cricketers he played with at school and provincial level in South Africa. However, Watling needs to be rushed back from his hip irritation after an excellent debut with the gloves against Zimbabwe in Napier. 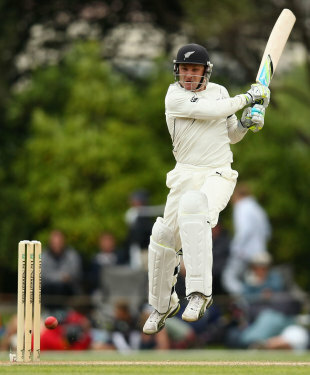 It was a bold punt from coach John Wright to select him as a wicketkeeper but with a maiden Test century, four catches in the second innings and the concession of just four byes (from a loose Trent Boult delivery) he deserves to return as soon as possible. Watling proved capable keeping up to Daniel Vettori's spin or back to the pace quartet. He used his feet well with the bat, was at ease clipping balls off his legs and patient leaving deliveries outside off stump. He has not lost that form, and has scored three half-centuries and taken eight catches in four innings for Northern Districts in the Plunket Shield since the Napier Test. Provided he stays fit and gets suitable support from his bowling comrades, the 37-year-old Martin is the New Zealand player who can make the biggest difference in this series. South Africa batsmen are his bunnies. Not many bowlers can claim that. He showed his skills again in the first innings in Dunedin with four wickets for 56 in 18 overs including those of Graeme Smith, Jacques Kallis and AB de Villiers. Of all Martin's wickets in Test cricket he has dismissed Smith (7) and Kallis (6) the most. Martin has taken 48 of his 222 Test wickets (21.62%) and four of his 10 five-wicket bags against South Africa, despite playing just 11 of his 66 tests (16.67%) against them. His best bowling figures in a match, 11 for 180, came in New Zealand's first win in a home Test against South Africa, at Eden Park in 2004. He averages 25.25 with the ball against South Africa compared to 33.32 overall. News Green Hamilton pitch expected to "brown off"